A new poetic name for early autumn has been added to the collection. Red Spider Lilies or 'Higanbana' flower after the first good rain of Autumn. They are originally from China, Korea and Nepal, are were introduced to Japan and from there to the United States and elsewhere. 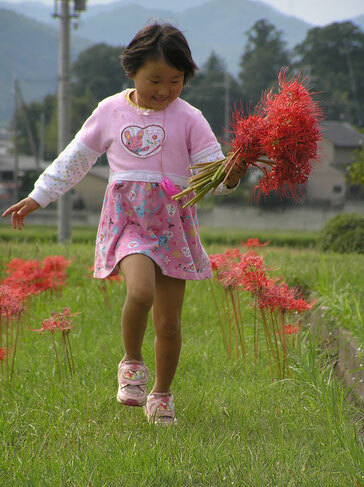 The bulbs of the Red Spider Lilly are very poisonous and are used in Japan to surround rice paddies and houses to keep pests and mice away. They can be seen wild and thick alongside rivers and fields at the start of autumn. A brilliant site. In Japan, the higanbana signals the arrival of autumn. Higanbana are associated with death and should never be given to people as a bouquet for this reason. Instead, they are used for funerary rites and planted on graves. As the flowers grow near cemeteries around the autumnal equinox, they are considered as ominous flowers in Buddhist literature. They are described as flowers that grown in Hell and guide people to the next reincarnation. The popular Japanese name higanbana (彼岸花) literally means the flower of higan, higan meaning 'the other' or 'that shore' of the Sanzu River, the river the dead must cross on their way to the afterlife (浄土 jyōdo). For me, I am terribly fond of these flowers, both for their light and dark associations, and the nostalgia surrounding the brilliant blooms. The first time I saw them was indeed after the first autumn rain. It was a fine day, the blue sky reaching up high. The thick, pale green and straw coloured grasses of the river bank near home were alight with these higanbana fire-balls. They looked like a hoard of warriors that had emerged from the underworld. Wiry, noble, lush, and with an ominous air of duty. With higanbana, Mother Nature takes a fiery sickle to summer and ignites the ageing ground. The Red Spiders make a vibrant parade among the wistfully swaying straw. They torch the cooling air, reaching up to soaring skies. The red flares tell us to prepare for the winter crossing and remember those who have already sailed to the 'other shore'.